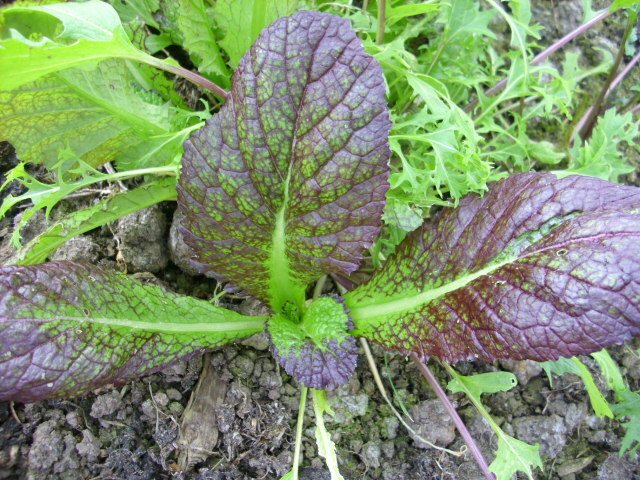 Arigna Natural Gardens » Rhubarb, salads and seeds. Rhubarb is emerging from its Winter hibernation now and I am so looking forward to harvesting it, especially for Rhubarb and Ginger jam. This lot has been heavily mulched with manure so should give a good crop. 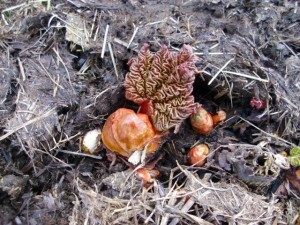 The stools (root divisions of Rhubarb) were obtained from our friends Denis and Rita near Castlebaldwin last Spring. As no harvest is to be taken in the first year this years crop is much anticipated. We have a row between the polytunnels of about ten plants. Rhubarb is a plant which copes well in our climate and soil so is a valuable addition to the garden, being the only vegetable that is used as a fruit! Elsewhere in the garden there is still lots to harvest. Kale, Chives and Tree Onion are providing lots of Spring pickings to complement the Carrots, Parsnips and Pumpkins in storage. In the polytunnel the Oriental Salads have put on lots of new growth, we have salad 3 or 4 times a week. Mizuna, Purslane, Rocket, Red Mustard and shredded Kale make for an interesting salad mix. Topped with our home sprouted bean sprouts are very nutritious too. Raw foods provide benificial digestive enzymes that are not available from cooked foods. 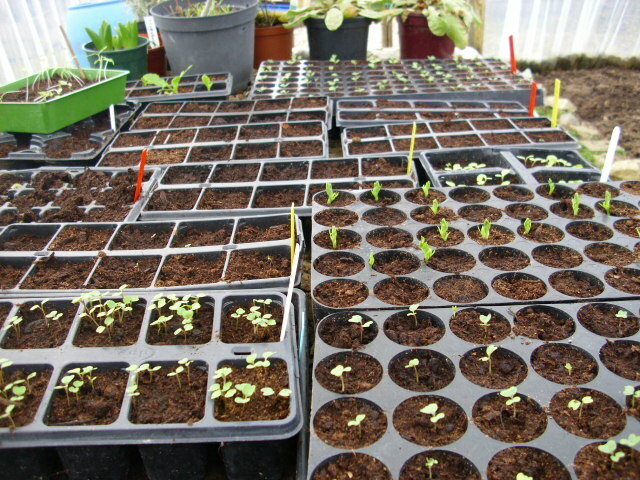 Seeds have germinated well and there is lots of pricking out to do. 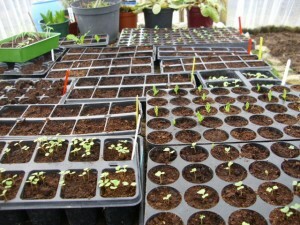 Peas, Cabbages and Broccoli are planted in modules, a single seed in each cell. This negates the pricking out stage and gives stronger earlier plants as they don’t have the same level of disturbance when moved on. Peas in particular do not like root disturbance, they are planted in large modules where they can stay until planted into their final positions. Many people plant Peas in guttering and this too seems to work well as the plants can be slid out in a row at planting time.